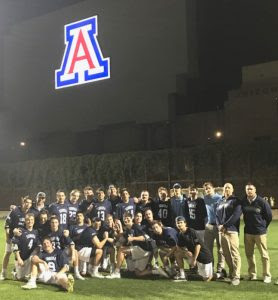 TUCSON, Ariz. -- The Sonoma State men's lacrosse spent spring break in the desert, dropping its the opening contest to reigning national champion Grand Canyon before finishing the trip with an 8-7 victory over Arizona. The first half with No. 2 Grand Canyon on Saturday was a back-and-forth affair, with the Lopes drawing first blood. Sonoma found a few pipes, and with some hard riding and precision shooting, notched two goals. Grand Canyon went into the first quarter break with a 3-2 edge. The second quarter was a defensive battle for both teams with the Lopes scoring the only goal to take a 4-2 halftime lead. It wasn't until the third quarter that the Lopes took control and were able to outscore the Seawolves 5-1 to take a 9-3 cushion into the final quarter. Grand Canyon would take down the 13-4 triumph. Looking to bounce back, the Seawolves headed to Tucson to battle the Wildcats. The Seawolves Hayden Dall drew first blood to take a 1-0 lead, but the Wildcats would score three unanswered for a first quarter lead. Sonoma wasn't done. Over the next two quarters, the Seawolves outscored the Wildcats 6-2 to take a 7-5 lead going into the fourth. The Wildcats battled and tied the score at 7-7 with just under five minutes to play. Angelo Lagomarsino took the next offensive possession and beat his defender to put the Seawolves up 8-7. A strong defensive stand to finish the game earned the Seawolves a victory. "It was a blue collar effort," said Sonoma coach Panchito Ojeda. "We knew both games would be a dog fight and we came prepared to battle. Each day our team continues to get better. Now we must focus on league play." Sonoma heads back to California with home games against Dominican on March 30 and Cal on April 7.